"Danger, Will Robinson!" DST is known for their incredibly detailed electronic cars and starships, and now they've built their first-ever electronic robot with the Lost in Space B-9 Electronic Robot Action Figure! 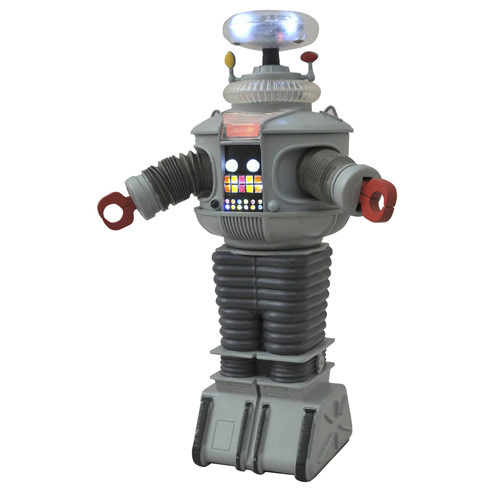 This 11-inch rendition of B-9, the friendly helper robot from Lost in Space, features lights and sounds taken straight from the classic sci-fi TV show. Lights on his head and chest blink constantly while B-9 is on, and additional lights and dialogue are triggered with the push of a button, including "I will accompany you, you may need protection," "Cannot compute, programming data insufficient," and his famous cries of "Danger!" You can also manually raise and lower his head, open and close his claws, extend his arms and turn his torso to the left and right. He even has wheels so you can roll him around! Requires 3x AAA batteries (included). Ages 8 and up.